Costa Rica Canyoning - Come and refresh yourself! Have you ever wanted to explore a tropical canyon, repel down a waterfall, hike through a rainforest, trek through a river, swim in a natural pool and fly through a jungle canopy, all in one incredible tour? 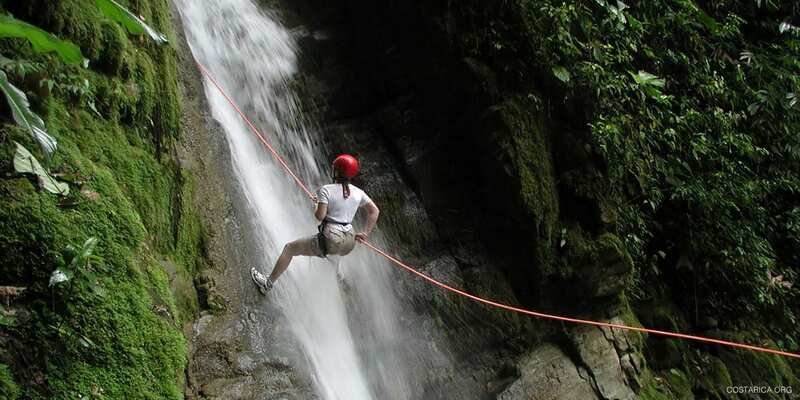 Then canyoning tour in Costa Rica is the tour for you. Canyoning is an amazing way to experience a tropical rainforest like a true adventurer. It’s also known as abseiling or rappelling and it’s becoming one of the most popular activities in Costa Rica. If you’ve done a canopy tour, you can think of canyoning like the next level of adventure tour. Waterfall rappelling is just the beginning on a canyoning tour. The tour usually starts with a short hike, followed by some tame rappelling to get you started. From there you’ll repel down waterfalls, hike through flowing rivers and over rocks, zip line through the jungle canopy, and swim in clear blue natural pools. Most tours offer lunch as well, so you’ll finish the tour with a traditional Costa Rican Casado among beautiful, tropical flora and fauna. Canyoning is a must-do on your next trip to Costa Rica! Rappelling forty meters down the side of a waterfall might sound frightening, but Costa Rica prides itself in offering safe and enjoyable tours for families. Canyoning tour guides take safety very seriously. You’ll start the tour with a safety presentation and the guides will make sure that your harness and helmet are secured correctly. Tour companies do daily safety checks of the equipment and the tour trails. You’re provided with a safety harness, a helmet and leather gloves to protect your hands. You must wear tennis shoes (some places have tennis shoes for rent if you don’t have any), shorts or athletic pants, and a quick-dry shirt. You may also bring your swimsuit. Don’t forget water and a change of clothes, shoes and socks for after the tour. Anybody of a medium fitness level can go canyoning. Kids who can walk and hike are able to keep up just fine. Check with your tour company about the age and weight of children who are participating in the tour. Older adults can successfully enjoy the tour as long as they are fairly fit and brave! The guides are with you the entire way and will make sure that everything runs smoothly and safely. Where is the best Costa Rica Canyoning? If you’re ready for an adrenaline rush, go canyoning in Arenal National Park, near La Fortuna. You’ll start with a short hike through the lush rainforest that offers and incredible view of the famous Lake Arenal. Then you’ll get a couple chances to repel. Beware of your glasses when you tour down the waterfall! The rushing water can knock them off as you descend. Then you’ll trek through the river, zip line, and swim in the refreshing river water! Make sure to bring dry clothes and socks! Canyoning in Manuel Antonio means canyoning some of the most diverse wildlife in the world! Canyoning tours will pick you up and drop you off in the Quepos/Manuel Antonio area. You’ll get a chance to warm on a small rappel, free fall into a deep natural pool on two monkey jumps, rappel down 1-3 waterfalls and admire the canopy from an amazing suspension bridge. The hanging bridge in Manuel Antonio is the longest and highest hanging bridge in the Central Pacific! It’s an experience you’ll never forget. After a hike through the famous cloud forest, expert guides will hook you up to the proper safety equipment and teach you how to descend down waterfalls. From there you’ll rappel down 6 different waterfalls! The tallest one 131 feet tall. The bilingual guides are all trained in wilderness first aid and CPR and the tours usually include transportation to and from Monteverde hotels. The tours only last 2-3 hours, which gives you plenty of time to go on the rainforest aerial tram, go on a horseback ride through the cloud forest or birding from the hanging bridges!